The Roaming Rider: The Dynamic Duo Rides Again! First - thanks for the advice and recommendations on pads. It seems everyone out there loves the Toklat Woolback and Coolback pads. I will definitely be looking into these. A friend has a Coolback she isn't using and said I can try it out to see if it would work. Worth a shot. The current Reinsman pad works just fine, stays put and produces an even sweat pattern and no sore spots, but it is a bit too short for the saddle. Hopefully I can sell the pad I have so I can buy a new one. Saturday was a day of ill preparation, bad timing and the Universe telling us to just go back home. Despite all of that we still managed to squeak in 6 miles of new trails and some fun. When Gem saw me pull in with the truck Saturday morning after working her both Tuesday and Thursday she definitely gave me the stink eye. She stayed at the gate though to watch me down at the barn. By the time the hubby pulled in, about a half an hour later, she knew something was up and gave us the horse equivalent of the middle finger: tail flagged high galloping to the far end of her pasture. The hubby went to get Pete (my rents watched W for us Saturday morning so we could ride together for the first time since last fall), but Gem was being such a snot running around bucking and snorting that there was no way he was going to get caught. After 20 minutes of her making a fool of herself, she let me walk up to her and put her halter on. She was soaked with sweat and breathing hard. Oh well...she had a 45 minute trailer ride to cool down. Unfortunately, these shenanigans in addition to a host of other unrelated and annoying things that held us up at home, put us a full hour behind schedule. My rents agreed to watch him from 8-12 and we didn't even drop W off until just after 9. It wasn't a good start to the day. But we were finally off. Since we were on such a time crunch we hadn't eaten anything yet and our bag of snacks/drinks was left on the counter at home. The hubs went to find the restroom and came back to report that there was a concession stand! I looked at my watch and it was already pushing 10, so we tacked up and prepared to get on as quickly as possible. Food would have to wait. S and her hubby L pulled in a few minutes behind us. We had spoken the day before and planned to attempt to ride as a group, but knew we would most likely split off at some point. 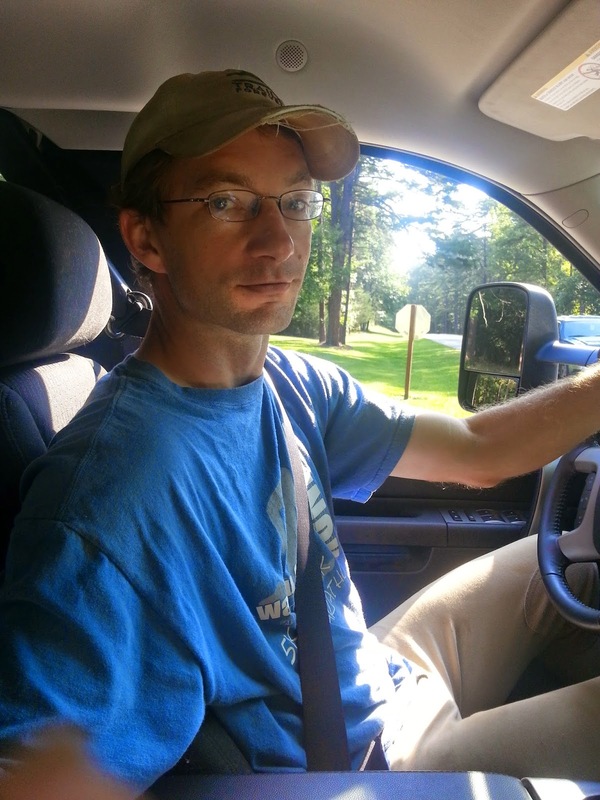 Pete is fast and furious on the trails and his idea of the perfect trail to run on doesn't really match up with S and L's thoughts. 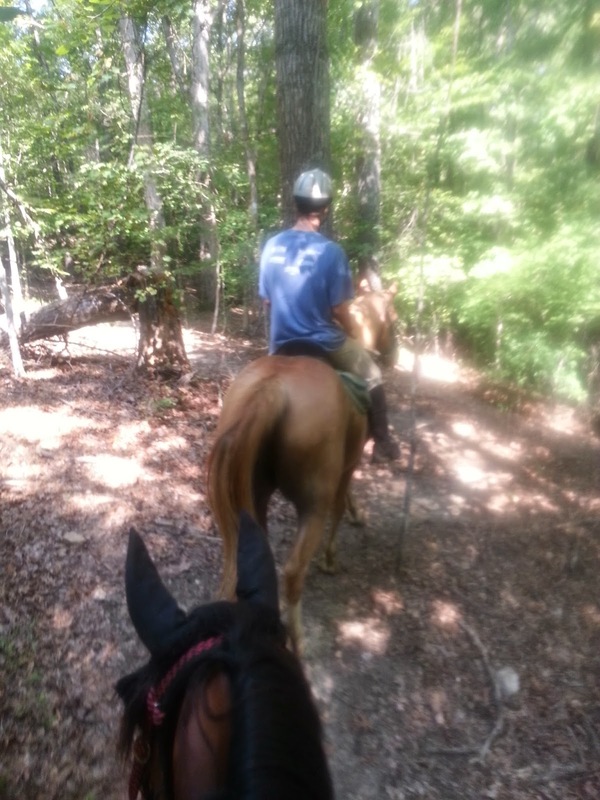 We waited around for them to get tacked up and finally hit the trail much, much later than anticipated. We entered at the first trail head we came across and Pete wound up in the lead. The trail was single track, but muddy and slick so we kept it to a sedate pace and stuck together for a while. 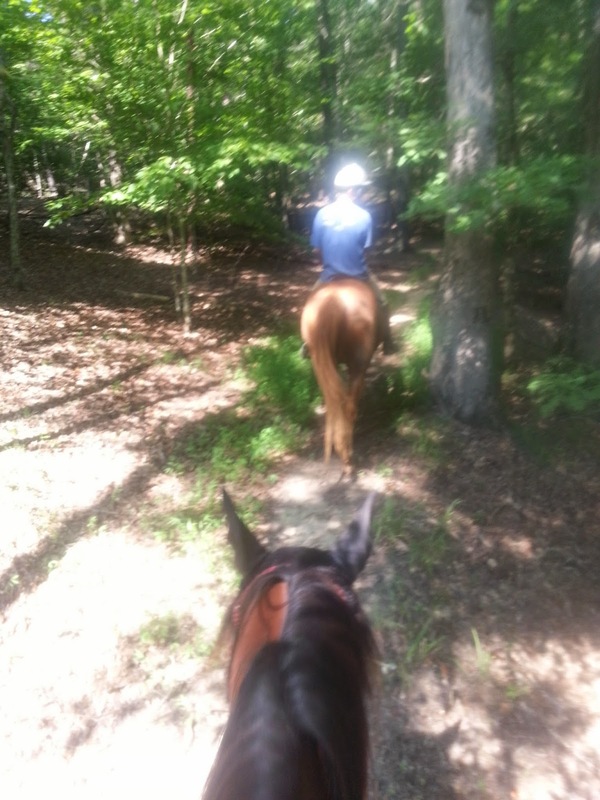 Once it dried up, we started trotting and then the hubby let Pete have his head a bit and we were off. When Pete does his "super trot" as we call it, Gem has to canter to keep up. I really wish I knew Pete's breeding. I am sure he isn't actually trotting at this speed - he is just too fast and too smooth. We ducked and dodged along the single track trail with trees close on both sides. I know Pete and the hubby were grinning and so I was. Gem, I'm not so sure, but her ears were forward and she was willing the entire time. I really miss riding with my boys. We have such a blast flying through the trees together. S and L weren't enjoying the pace on that type of trail, so they backed off and told us to go ahead without them. We kept it up quite a ways until we came to a fork in the trail. We hadn't been there before so both ways seemed ok to us and we went left. There were some pretty nice climbs and descents and the trail had excellent footing the majority of the way. Eventually we came to a spot where the trail went pretty much straight vertical down about 20ft then immediately back up on the same incline with a ditch on either side. I really didn't like the looks of it and since we had no clue where we were or if we would have to double back through it, I vetoed the idea and we turned around. Heading back we ran across S and L again. We described the trail and she suggested we take the other trail which led to the road and then cross over to the other side of the park. Along the way we ran across a mariachi band playing at a family picnic. S's mare was very much not enjoying the music, but Gem and Pete just glanced over there way and continued on. You would think that a horse that spooks at a stupid stick on the ground would mind the mariachi band, but no. Silly mare! We crossed over and I looked at my watch. Since we had dropped W off late, we bought ourselves until 1 pm, but it was now 11:15 and we had to be on our way out of the park by 12:15. We decided to follow S and L out a ways and then at 11:45 we turned around. The trail was absolutely gorgeous too, so I was da to part way, but Pete was dripping with sweat and falling behind which is very unusual for him. He was very tired. On the way back we decided to follow the road instead of the trail to save time and a mile later we were back at the trailer. The horses were sweaty and hot, so we untacked quickly and hosed them down. The concession food smelled too good to pass up so once we loaded them on the trailer we headed on over. I got a cheeseburger with the most delicious hand squeezed lemonade ever. I was so dehydrated and thirsty anything would have tasted good, but I love hand squeezed fair style lemonade. It was worth the $5. Hubby got a hash sandwich (still unclear what hash is, but the lady said something about beef, pork and spices) and a coke and we headed back home. We arrived only 15 minutes late (sorry, mum we had to get food!!) and picked up a tired W who had had a great morning with his grandparents. Hubby took the horses back to the barn and I took W home for a nap. 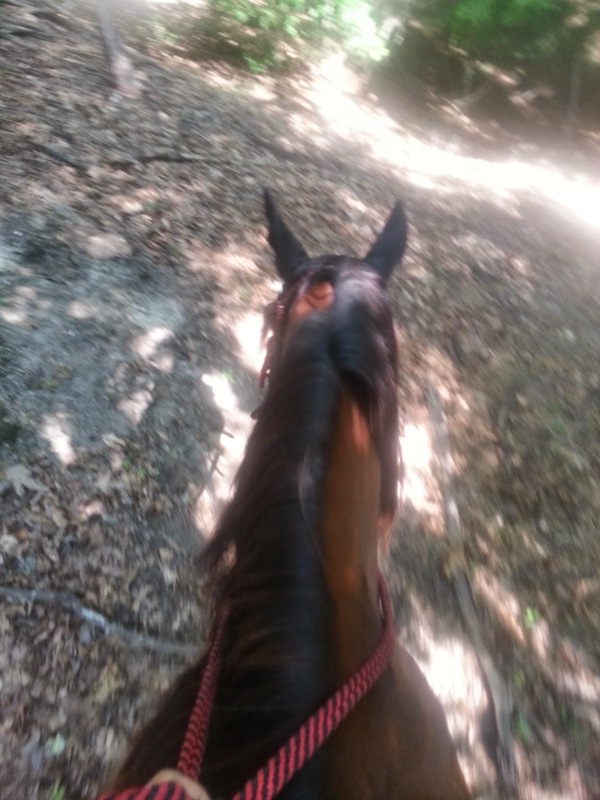 All in all it was a great time out on the trails and I really missed riding with the boys. Pete needs to get into better shape which will help him overall in life. next time we will have to go into it better prepared, leave on time and have less stress with the ticking clock. There are 17 scheduled hunter paces for the 2014-2015 calendar year and I am hoping to hit at least a few of the ones we missed last year which Pete excels at and enjoys. They are the right distance for him to enjoy (he hated the LD we took him on which is another story for another day) but these are right up his alley, so hopefully we can get him out and about this fall.